I had not painted horses for some time when a client commissioned this painting. 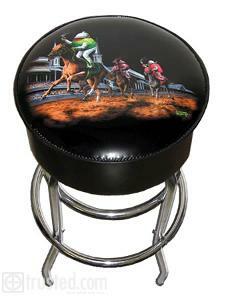 The client lost his brother and they shared a passion for Horseracing, so this was his tribute to their relationship. The reaction I get from people over this piece really kills me. You see some of the horses have only three legs. When people bring this to my attention I say, "Oh really! When was the last time you saw an olive riding a horse with four legs?"